The singer who would be called Angel Face was born on December 6, 1930 in New Orleans, as Elsie Mae Jones, the daughter of David Jones and Gladys Walmsley. In 1940, she and her mother were living in New Orleans with her family (grandmother, aunt, uncle, and cousin). Gladys Jones is a "shrimp picker". She began her singing career in New Orleans, appearing with Papa Celestin's Tuxedo Brass Band. In either late 1952 or early 1953 she ended up in Washington, DC. Most probably, she accompanied Celestin there and then decided to stay. While there, she got two new names: Elsie Kenley and "Angel Face". It's possible she adopted (or was given) the nickname from the Robert Michum/Jean Simmons movie "Angel Face", which had recently been released (in December 1952). She used the name "Kenley" from at least July 1953, but I don't know where it came from. I assume it's her married name, but I've been unable to find any substantiating marriage records. In February 1954, she told Social Security that she was Elsie Mae Kenley. This looks like her original Social Security application (that is, she didn't originally sign up as Elsie Mae Jones). Frank Motley, Jr. was a character. He was born on December 29, 1923 in Cheraw, South Carolina, the same town as Dizzy Gillespie. In fact, the older Dizzy taught Frank a lot about trumpet playing. But Frank knew that, even if you did it well, there were loads of trumpet players out there that he'd be competing with. He needed a gimmick and the one he came up with was unique: he taught himself to play two trumpets at once, becoming Frank "Dual Trumpet" Motley. By late 1950, he, too, had ended up in Washington, DC and had begun doing the club circuit. 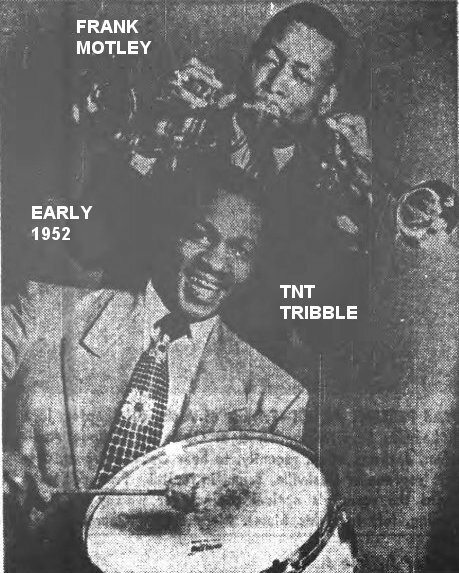 Lillian Claiborne, owner of DC Records, teamed Motley with drummer TNT Tribble and the two went on to form the Motley Crew. Initial sessions were held in Washington in early 1951, but in April, Mrs. Claiborne placed Motley with Ivin Ballen’s Gotham Records of Philadelphia. When those records failed to sell, Ballen released Motley, who had subsequent releases on DC Records. Mrs. Claiborne also placed masters with several other record companies: including Specialty, Gem, Josie, Big Town, and Hollywood. There were also some on Okeh, but those were recorded at Okeh itself. The September 1953 papers were full of articles about Motley's 5-piece combo getting ready to tour the Deep South. 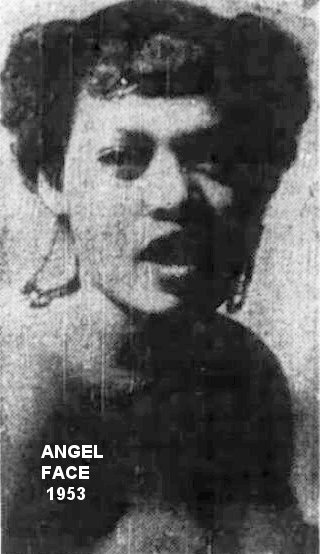 The September 1, 1953 Washington Afro-American said that the Motley Crew was "... riding high on its recording of 'Dual Trumpets Bounce' on DC Records and several blues recordings by Angel Face." 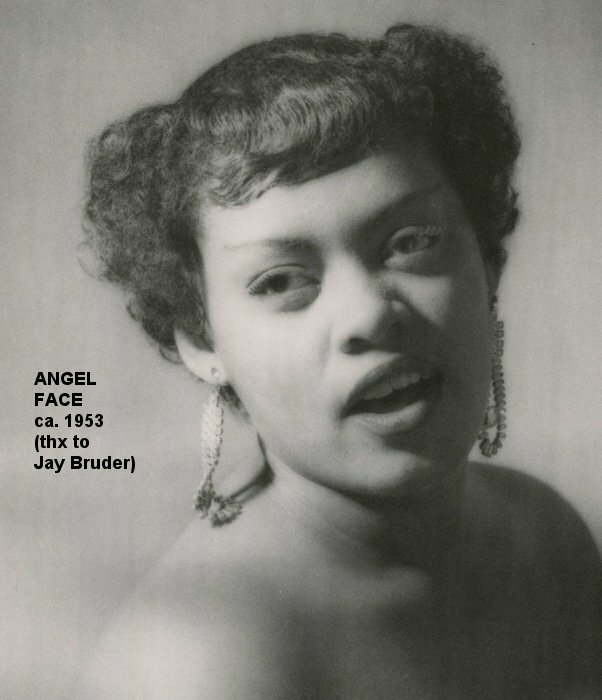 This is another instance of papers getting it all wrong: they couldn't be riding high with "several blues recordings by Angel Face" because nothing by her had yet been released! I'm sure they just meant that several Angel Face sides had been recorded. Frank's dual trumpeting sounds OK to me, although his trumpet playing is a lot more interesting when he puts one of the horns down. Happily for Frank, the tour was scheduled to kick off in his home town of Cheraw, South Carolina on September 18. From there it would wend its way through "the leading cities in South Carolina and then move into Georgia." 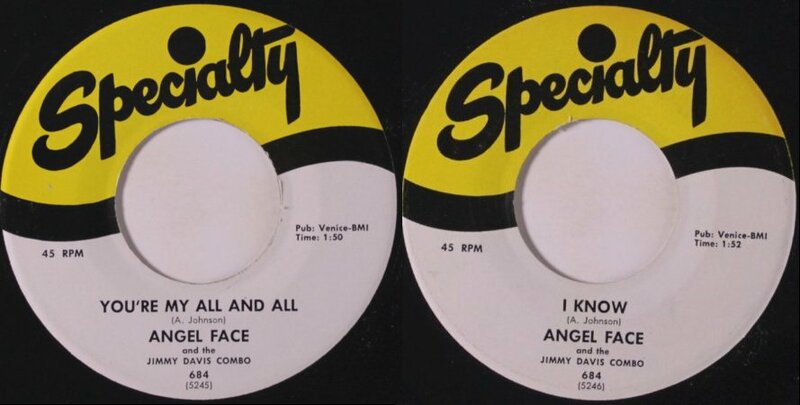 Here's all that article could say about Angel Face: "Angel Face, an added attraction and a real asset to Motley's combo, hails from New Orleans, La. 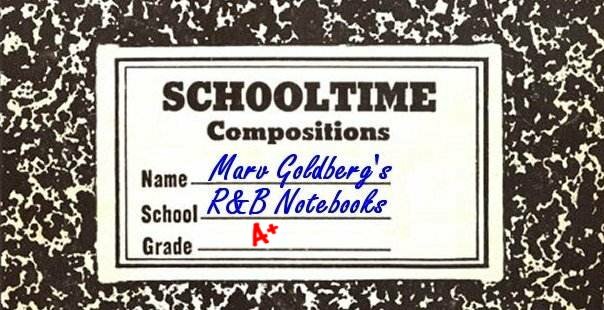 and is just as great with the top tunes as she is with blues." This is the most that was ever written about her in all the resources I have access to! 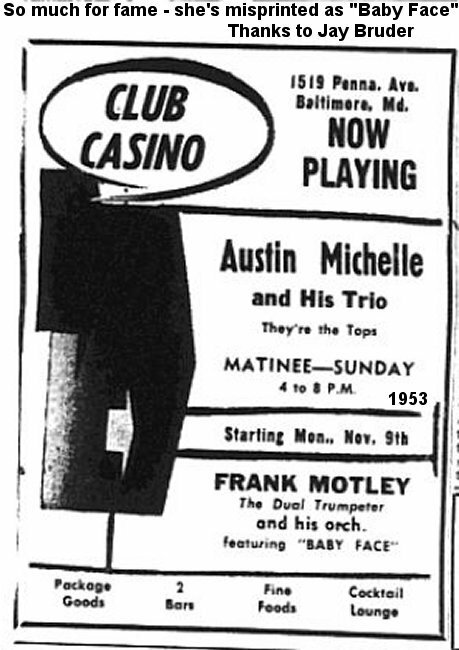 In November 1953, they played the Club Casino in Baltimore, Maryland (although the ad called her "Baby Face"). 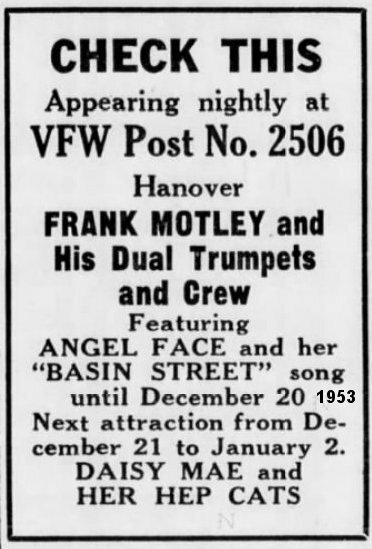 In mid-December, "Frank Motley and His Dual Trumpets and Crew" were at the VFW Post 2506 in Hanover, Pennsylvania. Featured was "Angel Face and her 'Basin Street' Song" (whatever that was). They'd be there through the 20th, after which Daisy Mae & Her Hep Cats were booked. Since DC Records farmed out many of its masters to other record companies, Angel Face's first record came out on Gem: "What's That Stuff Joe's Got", backed with "Keep Your Head Up High". 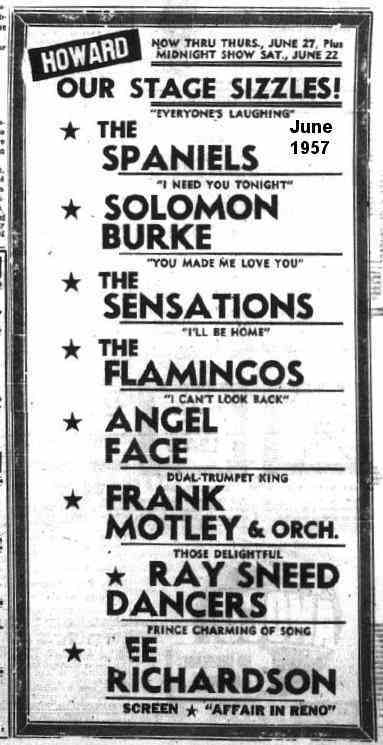 While not reviewed, they were mentioned in the Records Released This Week column of the January 9, 1954 Billboard (which probably means they were actually released in December 1953). Angel Face was on her way. All her recordings through 1956 would be backed by Motley. There was supposed to be a second Gem release, "Don't Ever Leave Me", backed with "Indeed I Do", but it never came out. The master to "Don't Ever Leave Me" was then farmed out to Big Town Records, where it was issued, later in 1954, as "Don't Ever Leave Me Again". Its flip was "When The Saints Go Marching In", another vocal by Angel Face. The back-up was credited to "Frank Motley & His Crew". "Indeed I Do" finally came out in 1963 on the "Original Hits - Golden Oldies Volume 5" LP, as "Baby Indeed I Do". The record was reviewed on October 30, 1954, with "Don't Ever Leave Me" rated "good" and the flip ranked "fair". Other reviews that week were for the Midnighters' "Annie's Aunt Fanny", the Lamplighters' "Yum Yum", the Rivileers' "Eternal Love", Roy Brown's "Black Diamond", the Strangers' "Drop Down To My Place", the 5 Jets' "Everybody Do The Chicken", Smiley Lewis' "Too Many Drivers", the Ramblers' "Vadunt-Un-Va-Da Song", and the 5 Dukes Of Rhythm's "Soft, Sweet And Really Fine". 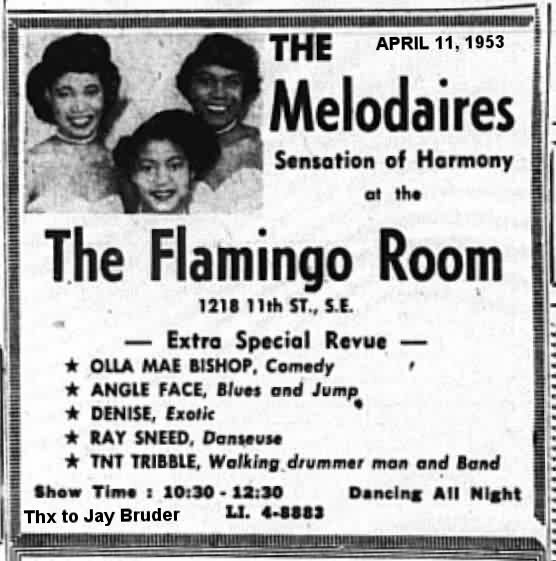 In March 1954, the Motley Crew was at DC's Club Trinidad. A writer for the Washington Afro-American saw the show while sitting at a table talking with Billie Holiday. 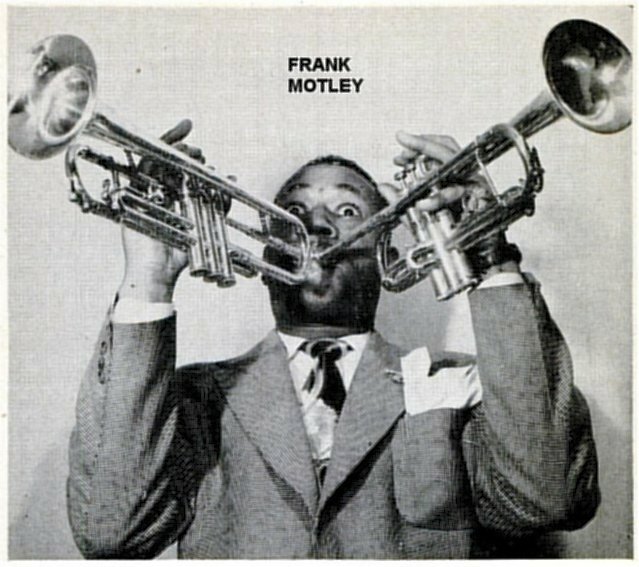 He wrote (April 6, 1954): "On the podium was Frank Motley's combo. As the boys say, they might not have been good, but they played loud." Ouch. 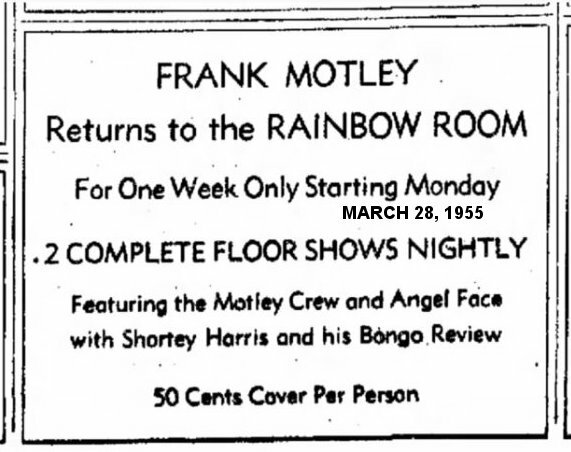 Frank, the Motley Crew, and Angel Face were at the Rainbow Room in Hagerstown, Maryland in March 1955. (Also on the bill was Shortey [sic] Harris & His Bongo Review!) After that, it was the Club Roc Mar in Schenectady, New York. Around March 1955, Big Town released "Honkin' At Midnight", which is mostly an instrumental by "Frank Motley & His Motley Crew", but has an interchange between Angel Face and Motley's pianist, Jimmy Crawford. The flip, "Frantic Love" features Lee Vernon on vocal. (I don't know who Vernon is, this is the only time I can find that name associated with Motley.) Probably in early 1955, Angel Face recorded "I Got A Man", a female version of Ray Charles' "I've Got A Woman", but it was never released. Another unreleased track was "A Song To Make Happy" [sic]. November 1955 found them at the White Elephant in McKeesport, Pennsylvania. Claiborne released an Angel Face recording on DC around June 1956: "I Was Framed"; the flip, "Don't Go", has a vocal by Curley Bridges. Band credit went to "Frank (Dual Trumpet) Motley & His Crew". Two more DC recordings by Angel Face were farmed out to the Hollywood label in September 1956: "Boomerang Lover"/"The Last Time" (backed by Frank "Dual Trumpet" Motley & His Crew). The disc was reviewed on October 13 (both sides "good"). Strangely, the reviewer credited the vocal on both sides to Motley himself, even though the label clearly states that it's Angel Face singing. Other reviews that week were for the Cleftones' "String Around My Heart", the 5 Royales' "Just As I Am", the Heartbeats' "A Thousand Miles Away", the Wheels' "Loco", the Cadillacs' "The Girl I Love", Sax Kari & Quailtones' "Tears Of Love", and the Chips' "Rubber Biscuit". The next month, there was an Angel Face record on Okeh: "I Can't Look Back"/"I'm Gonna Stay In Love". The "orchestra" was under the direction of Frank Motley. The Okeh record was reviewed on October 27 (both sides "good"), along with Shirley & Lee's "I Feel Good", the 5 Satins' "Wonderful Girl", Chuck Willis' "Juanita", Sonny Knight's "Confidential", Bubber Johnson's "Confidential", Charles Brown's "Confidential", Clarence Henry's "Ain't Got No Home", Jesse Belvin's "Goodnight My Love", the 4 Fellows' "You Don't Know Me", and Annie Alford's "It's Heavenly". In February 1957, the group, with Angel Face, appeared at the Esquire Show Bar in Montreal. The little write-up in the Montreal Gazette of March 2 indicated that this was a return engagement. In the late 50s, Motley would move his entire organization to Canada, taking up residence there. However, that didn't seem to include Angel Face, although she was certainly with him for some of the Canadian shows. 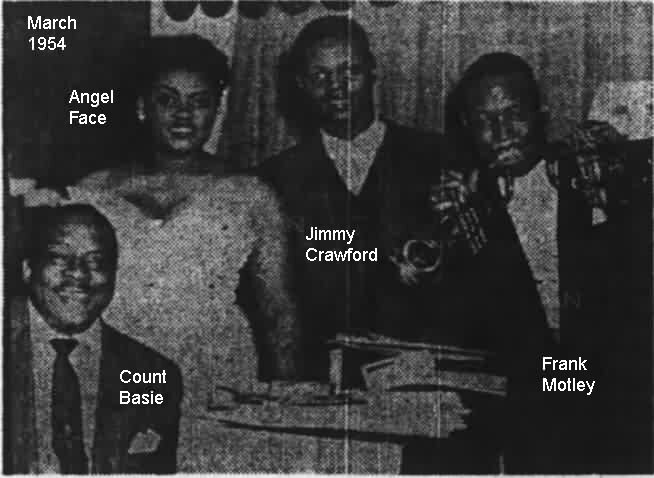 By the beginning of 1959, Angel Face had put together her own band, called the Swingmasters. The only member of the group ever named was organist James Dayton. 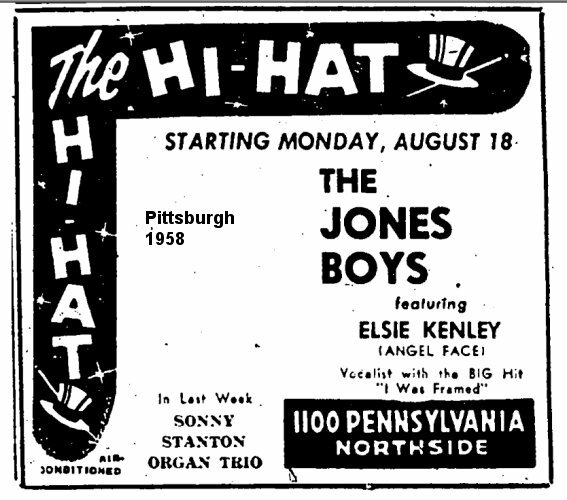 They were at the Hi-Hat Club for a week beginning March 10, 1959. Her June 1959 record, on DC, was with the Swingmasters: "Listen Baby"/"What's This Fussin'". That record was reviewed ("Listen Baby" as "fair" and "What's This Fussin'" as "poor") the week of June 22. Other reviews that week were for Little Willie John's "Leave My Kitten Alone", the Solitaires' "Light A Candle In The Chapel", Eugene Church's "Miami", the Chateaus' "Ladder Of Love", the Click-ettes' "Lover's Prayer", Lincoln Chase's "Deep In The Jungle", Little Butch & Vells' "Sometimes Little Girl", and the Laddins' "Yes, Oh Baby, Yes". In May 1962, DC reissued "Honkin' At Midnight"; this time, its flip was "What Can I Do", with a vocal by Curley Bridges. 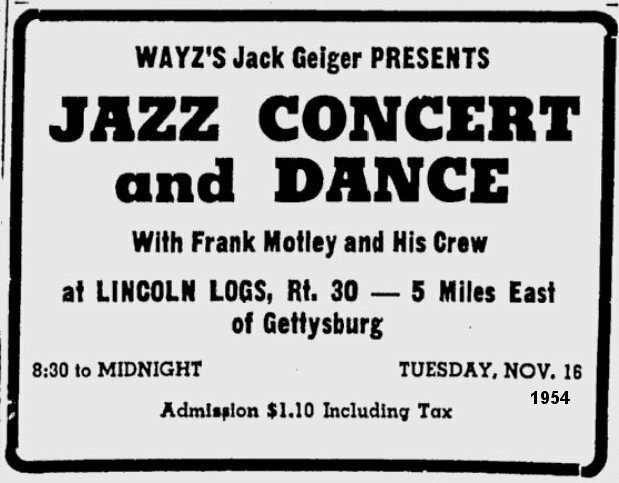 Note that there are two different labels for this on DC: one says "Honking At Midnight" by "Frank Motley & His Motley Crew" and the other says "Honkin' At Midnight" by "Frank (Dual Trumpet) Motley & His Motley Crew". Considering that "Honkin'" was seven years old at this point, Billboard still gave it a "good" rating. I can only find a single further mention of her, but it has nothing to do with singing. 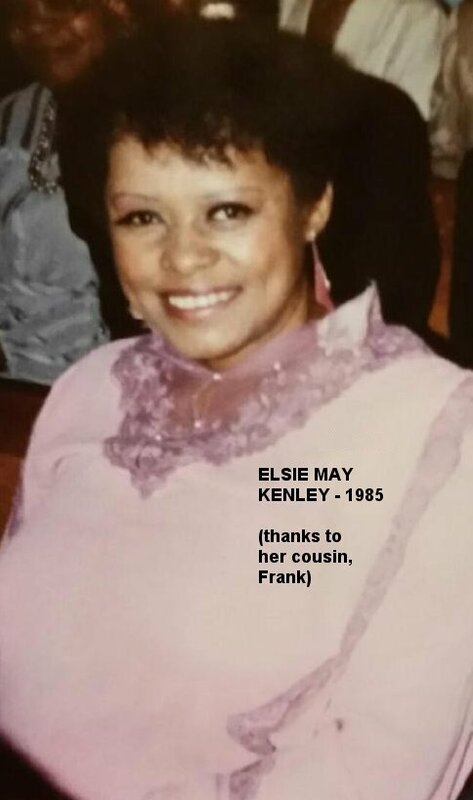 The New Orleans Times-Picayune of November 14, 1987 reported that, "A man, about 19, told Elsie Kenley, 56, she owed him money, and grabbed her purse Wednesday at 10:20 p.m. Kenley grabbed her purse back, and the man stabbed her in the leg with a sharp object. Kenley drove home and called police." Elsie "Angel Face" Kenley died May 16, 1991 in New Orleans. In keeping with her low profile over the years, there was no obituary that I could find. 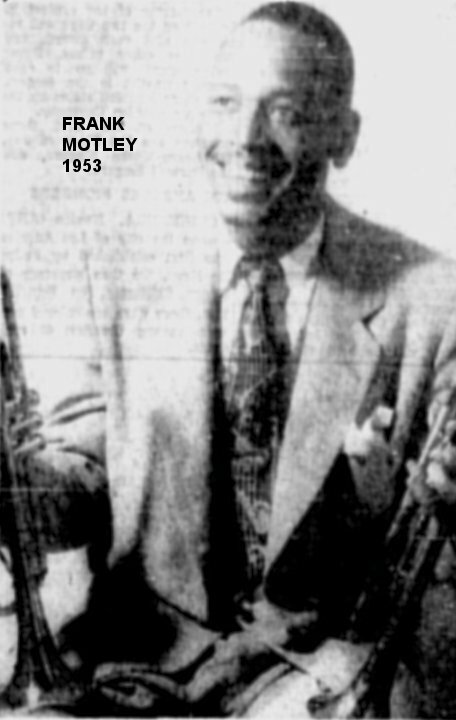 Frank Motley died on May 31, 1998. Special thanks to Lynn Abbott of the Hogan Jazz Archive, Jay Bruder, Ian Shadwick, and Gary Adams. Scheduled for release, but not issued. Same song as Big Town 114. "Indeed I Do" finally came out in 1963 on a Design LP - "Original Hits - Golden Oldies Volume 5" (DLP 705) as "Baby Indeed I Do"
With Frank Motley & His Motley Crew. 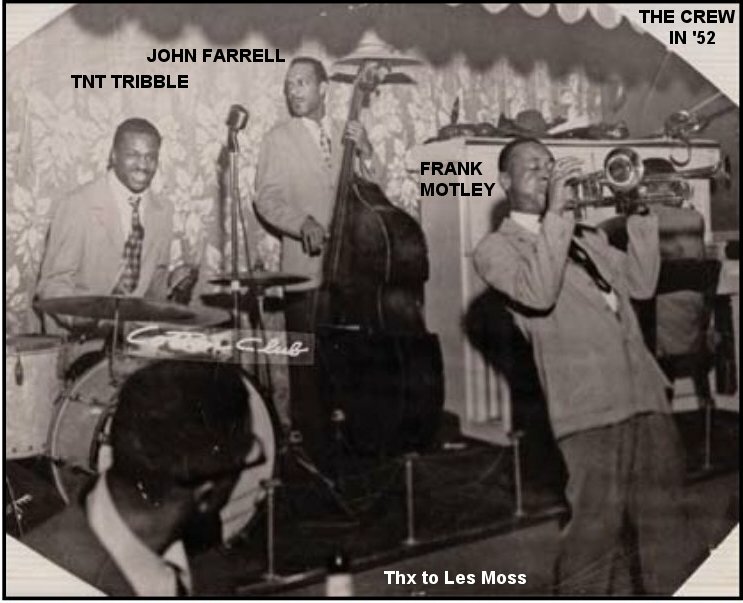 Frank (Dual Trumpet) Motley & His Crew. Vocal on "Framed" by Angel Face; vocal on "Don't Go" by Curley Bridges.